Spotted Hyenas get a bad rap as being unwanted scavengers, but that's not the truth. Hyenas are omnivores (meaning they eat both plants and animals), they hunt as well as scavenge lion, cheetah, and leopard kills. They are also pack animals, they are lead by a large female. The reason the alpha female is bigger then the males and other females is because she has more testosterone then the others making her more dominate and aggressive, all the others including the females have the same amount of testosterone. No one knows why Hyena females have the same amount of testosterone as males. 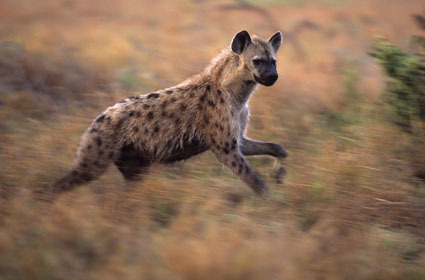 Hyenas are semi-fast animals, running up to 30mh for miles with out stopping, sometimes they use this advantage to chase their pray until it dies from heat stroke. Like human ancestors may have done before hunting tools were available. Hyenas are not dogs, they are more closely related to cats then dogs. Even so Hyenas are still in a class of their own called Hyaenidae. Only the higher ranking females are aloud to reproduce, the alpha females cups tend to be bigger in size because they inherit their mothers testosterone, making them much higher in rank then the other cubs. 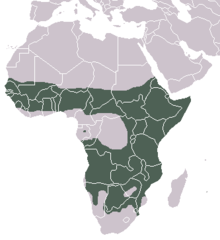 The Spotted Hyenas range is most of the African grassland and some of the forest too. Their are no isolated pockets on the map, showing that inbreeding is at low risk.